It was an enchanted evening at McKay High School Saturday night. Cobblestones, candles, a carriage and a castle set the scene for the school’s third annual special education prom. The band room was transformed with twinkling lights, music and not one, not two — or even three — but four cakes. The night kicked off with the song “When you wish upon a star.” Students rushed the dance floor when Mark Ronson and Bruno Mars’ “Uptown Funk” came on, bringing with them some of their best dance moves — slow motion dancing, poses, head banging and dramatic lip-syncing. If they weren’t dancing, students were laughing with their friends and filling plates with pizza, sandwiches and other goodies donated by local stores and restaurants. “The event has been so successful due to the collaboration with teachers — both special (education) and regular (education), the help of the supportive regular (education) students … and the community,” Oaks said. The hours leading up to the prom were perhaps just as special for the students as the dance itself. Volunteers helped each student get dressed and look their best, giving students the opportunity to have their hair and makeup done. For weeks, her office was filled with dozens of donated clothes, waiting to be worn. The standing rack leaned in one direction and nearly fell over from the load. Jessica Driver, a student in the special education Life Skills class, was excited to attend the dance for the third time. She picked a baby blue gown from the collection and got matching eyeshadow and jewelry with the help of a few volunteers. Her hair was braided and curled, making her as Cinderella-esque as her friends described her. “It’s really great to (come) to school, but not have to work and just have fun, listen to music … and eat lots of food,” she said. Driver wasn’t waiting for any one song to come on, she said she was ready to dance to anything. Olivia Satterlund-Stearns, a McKay graduate and current Willamette University student, did Driver’s hair. Satterlund-Stearns used to work as an aide in the special education classes in high school and she continues to volunteer at the annual dance. Lizbeth Castaneda, 16, helped set up and arrange the prom for the first time this year. She works as an assistant for Oaks during the school day. “I love their (personalities); the environment makes me happy,” she said, talking about working with the students in class. Many businesses, including Safeway, Costco, Pizza Hut, Roth’s and McDonald’s, made cash donations and donations of food and materials, which Oaks said made the event possible. 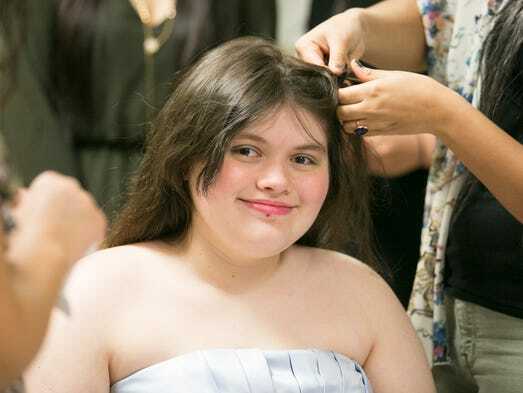 The prom was open to students in the four special-needs classes at the school, and also to the students’ families and friends as well as any McKay student wanting to take part in the fun. Sasha Davidson, a teacher in the Education Resource Center, used to teach at North Salem High School. When there, she said, they didn’t have a dance like this and, instead, they took the students to a similar event in Portland each year. She hopes they are able to raise enough money to combine the dance with other schools in the future. Oaks looked around the band room when the dance began, seeing dozens of people partake in the evening. “I’m going to start crying,” she said, as she turned around to leave the room. Contact Natalie at npate@StatesmanJournal.com, 503-399-6745, or follow her on Twitter @Nataliempate or on Facebook at www.Facebook.com/nataliepatejournalist. Restraint and seclusion: struggle or safety?